Have you ever came across to have your own dream dressing room ? Oh, I always dream to have one. If you ask me why I dream to have a dressing room ? My answer definitely to have my private runaway. You know something like , when I try each of my outfit , I can pose like a model privately. #evenIwishtobeamodel #butmyheightnotallowedme . hahaha. And, easier for me to choose what to wear because every outfit been arranged accordingly based on the category , as well as the colors. Or , whenever there is a functions or event that I need to attend such as fashion show, my friends could come over to my house and get ready in my dream dressing room and we can pose like a model before we heading outttt~ . It will be much fun !!! The colors that I will choose for my dream dressing room, of course ; white, pink and a little bit touch of rose gold or colors as per below picture. Let's see , what's are my dream dressing room looks like. 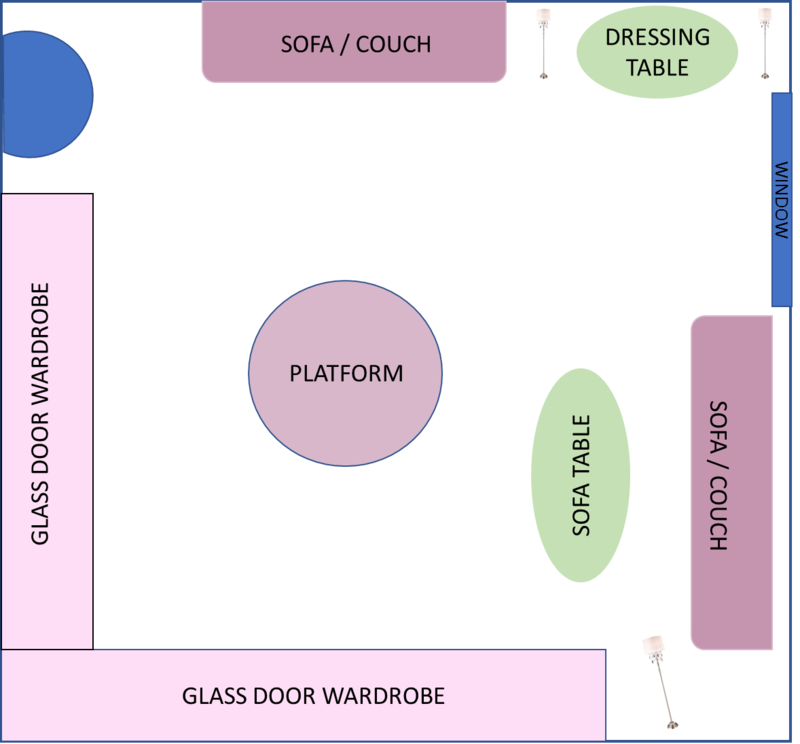 If you look at the layout , I want a simple dressing room but beautiful. I will share type of furniture that I wish to have for my dream dressing room . I want a full glass door wardrobe because it's easier for me to see my outfit in a full image - from top to toe. The wardrobe will looks like below pictures. The sofa or couch must be in pink pastel color as shown in picture below. Something small but it have a compartment that I can arrange my makeup accordingly based on each category . Maybe the table will looks like two picture below. Either one. 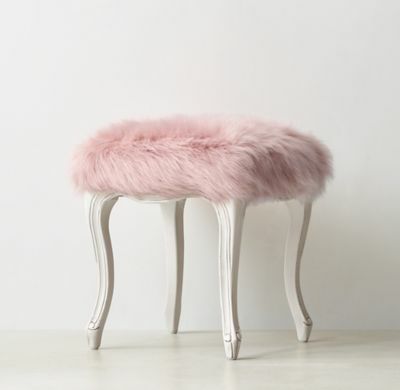 But, I want a pink fur stool to match with my white dressing table. See, how cute the stool is. This table will be in white color . The purpose of this table is when my friend or family come over to try out some of my outfit or we are getting ready for some events. This table can be use to put a glass of water . And, there are some fashion magazines on the table as well for me get any inspiration about fashion or outfit to wear. 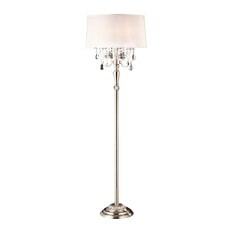 The floor lamp maybe will looks like below . The pink lamp cover and little bit of dangling crystal . I want this to be in my dressing room because it easier for me to make a pose whenever I've try each of the outfit . Hahaha. This is the important one. I totally want a white wall paneling . It must be a white to get the bright effect and makes the room looks big. The tall window must be near to dressing table so that I can get a natural lighting when I do my makeup. The curtain must be in pink pastel color. 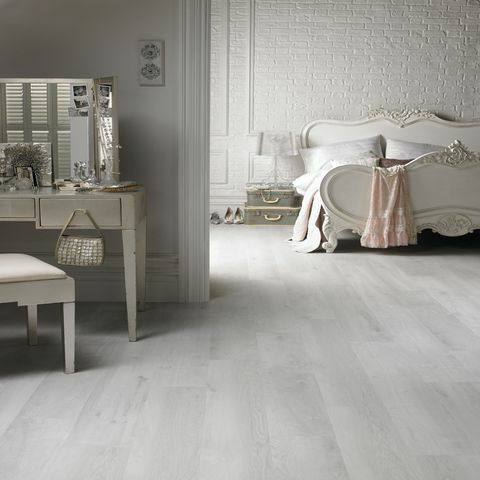 The floor that I want is a white Pergo flooring - the name of the colour is " winter Oak plank. If you want to see other colors of the Pergo flooring may visit here. 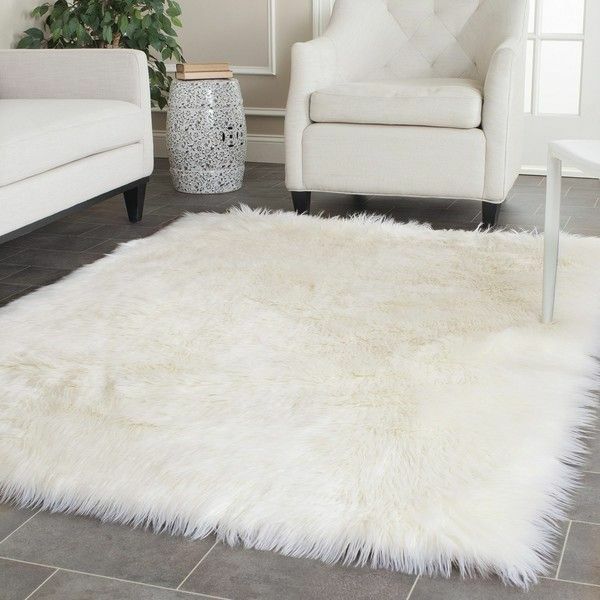 And, there will be a small faux fur rug around the wardrobe area and under the coffee/sofa table. Lighting is an essential part of any dressing room. There are many different light fixtures, including pendant lights to choose from , when it comes to picking out light for your dressing room . I'll choose a small pink chandelier to give the room looks more elegant and classic yet cute. Oh , but I'll use the LED bulb to save energy . hihihi. Can you imagined how my dream dressing room will looks like after seeing all the details I've shared? But, it's okay . I think this also is more than enough right? Arghhh~ I wish to have my dream dressing room as soon as possible . I just can't wait to play with my outfit with a bunch of friends coming over and pose like a model. Hahaha. And, of course photograph !!!! What about you? Do you already have your own dream dressing room in mind? Let's share your thoughts. 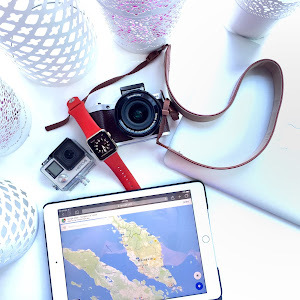 Yg ditunjuk tu semuanya wonderful. But the wooden floor tu. All my bedrooms lantai wooden planks. Hard to maintain. Tak tahan air. Maybe mine not that white oak kayu. Mine bukan Pergo. Biasa punya. 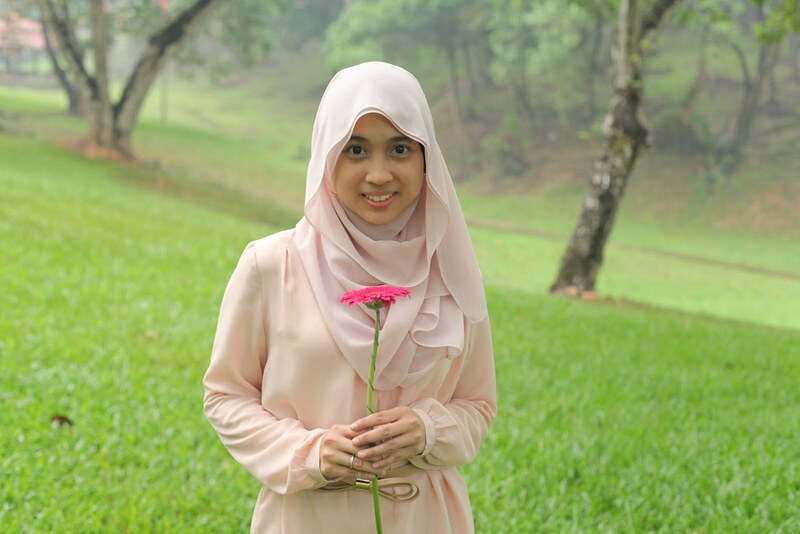 Tu yg i kata above, "maybe mine not that white oak." I never gave thought about this room though I do like the idea of white paneling and plush carpets. I want a playroom actually - my little escape room and just to hang out. I would love some big windows since I just love natural lighting. Bestkan Cik epal . 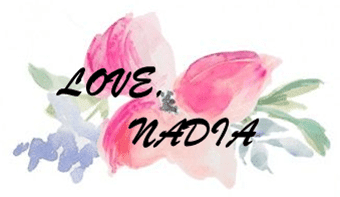 Nadia mampu berangan je for now mana tahu akan ada satu hari . Hihi . Kalau dah ada dresssing room camni, please invite me to your house 😍 cantik weiii! Suddenly I wish that I have the same idea of dressing room like you. Haha. I love seeing Hannah Motanna that she have a secret wardrobe behind her tiny wardrobe. Lols.